The 9 Best Pho Restaurants in Rhode Island! 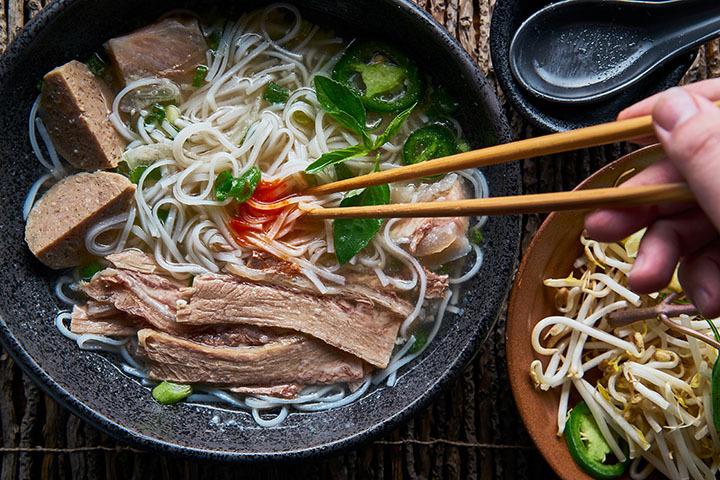 If you’re a lover of the delicious Vietnamese noodle soup pho, you’ll want to make a stop at one of these awesome Rhode Island restaurants. These piping hot, flavorfully-rich bowls of noodles are so hearty and delicious, you’ll want to come back for more. Here are the 10 best pho restaurants in the Ocean State. Located in a little strip mall in Pawtucket is this fantastic pho restaurant. Order their famous beef noodle soup, which comes with your choice of fine meat within a rich beef broth. On the side, you’ll get a plate of bean sprouts, fresh basil, sliced lime, and jalapeno. Hons House of Noodle Soup serves a delicious bowl of pho, with all the classic toppings. If you’re not up for soup, try one of the steamed vermicelli patties. Their large portions will leave you with plenty of leftovers, too! Minh Hai has been serving up authentic Vietnamese food every day since its opening in 2005. The owners are proud to offer healthy food that packs plenty of taste—such as their aromatic pho, of course. Try the pho xe lua, a large noodle soup with steak, flank brisket, tendon and tripe. Wongs Kitchen opened recently on Waterman Street to rave reviews. All of their Chinese and Vietnamese fusion combinations will be sure to please the taste buds, but you’ll only want one thing on the menu: the pho. Sit down and enjoy a delicious hibachi dinner, too, if that suits your mood! This quaint little Vietnamese restaurant offers eat-in, take out and catering options seven days a week from 11 a.m. to 9 p.m. Make sure to try the pho, which comes with your choice of yellow or rice noodles. Try it with the beef meatballs or thinly sliced eye-round beef. For dessert, try one of their great smoothies, like the taro or fresh jack fruit smoothie. The family-style plates at 4 Seasons offer a great variety of Cambodian, Thai, Chinese and Vietnamese cuisine. If you’re looking for pho, head straight to the “noodle soup” portion of the menu. There, you can order a heaping bowl or egg noodles with wontons or a white rice noodle, with a generous helping of seafood, roast duck or pork—all for under $9. One of the East Side’s best restaurants, Noodles 102 loves noodles so much that they put it in the name. Start off your meal with some scallion pancakes or lettuce wraps, and then order a noodle soup to enjoy. Customize your noodles—choose from egg, pho, udon, skinny rice, somen, soba, or a flat udon noodle, and then choose your add ons! If you’re looking for a special broth, try the coconut curry or spicy miso broth. Bring your own beer to this buzzing pan-Asian restaurant! The pho is the cheapest you’ll find around—at $6.50, you’ll get the classic pho with beef, beef ball, tendon, and tripe. At that great of a price, you might want to try the bubble tea or Thai iced tea for just a few dollars more on the side! The pho at Aroy-D only comes in one size: large. You’ll come for the pho—served with tofu, vegetables, beef, duck, shrimp, seafood, or a combination of the three—but stay for their amazing stir fries. Try the hot basil stir-fry, which comes with bell pepper, mushroom, bamboo shoot, and green beans.